So, leave your electronics*, rally the kids, don your favorite cowboy hat and get ready for an action-packed, all-inclusive dream trip to Montana and Yellowstone National Park. If you’ve never went a week without your phone, this is the trip for you! With roots deep in Montana soil, it’s no surprise that Austin Adventures is the leading provider of best-in-class travel from Old Faithful to Paradise Valley and beyond. From gurgling geysers to lofty mountaintops, discover the perfect backdrop of your next family photo on this intimate journey through Big Sky Country. 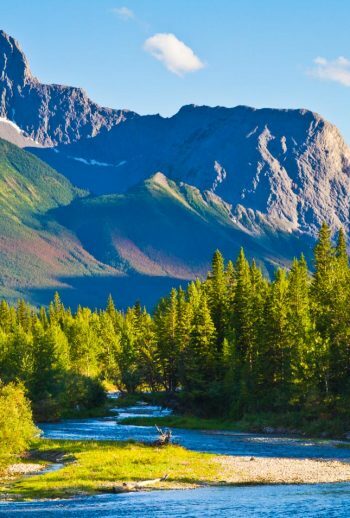 Our expert guides can’t wait to introduce you and your family to the remarkable treasures of the wild, wild west as you explore pine-studded forests, raft the Yellowstone River and ride horseback across pristine meadows with a couple of bona fide cowboys. Each day, enjoy the finest in western hospitality and regional fare complemented with Austin’s signature touch of inspired, thoughtful service. You and your buckaroos won’t soon forget this adventure of a lifetime! The only thing better than signing up for one of our award-winning adventures is joining us on a custom family getaway in our own backyard! With Austin Adventures’ headquarters located in Montana, we invite you to fall in love with the picturesque scenes we call home. Spend six unforgettable days discovering the gems of Yellowstone National Park and Big Sky Country with your kids-turned-blooming-naturalists. And don’t worry – there’s plenty of time for soaking in a natural hot spring, too! *Operating under permit with the US Forest Service/National Park Service. In the west, life has certainly gotten easier than it was in the early days, even at a Montana guest ranch. But some of the things that mattered most back then are still important today; like delicious, hearty meals, and the 320’s friendly, laid-back attitude. Experience a 110 year old homestead – reshaped into a Montana guest ranch. Relive the early western atmosphere and down-home hospitality – all in one big beautiful, historic property. The 320 Ranch offers exceptional cowboy comfort just south of Big Sky Ski Resort, where the pristine Gallatin River winds through sage and towering pines, and mountains rise up against crystal blue skies. The perfect location for your Montana getaway. This historic resort is located in the heart of Paradise Valley, just north of Yellowstone National Park and nestled in the foothills of the breathtaking Absaroka Mountain Range. Chico offers an extraordinary variety of accommodations, exceptional dining, outdoor adventures, live entertainment, ultimate relaxation, all with a warm smile and welcoming spirit from their friendly staff. This rustic-chic inn and day spa boasts mineral hot spring-fed pools, extensive gardens, & soothing spa services. In June of 1999, Chico Hot Springs was listed on the National Register of Historic Places. Shuttle to the Flying Diamond Ranch and mount up for a leisurely morning horseback ride high into the Absaroka Mountains. Our picnic lunch spot boasts spectacular mountain views. A short afternoon hike to a backcountry waterfall will set the stage for a perfect evening. Back at Chico, soak in a natural hot spring before feasting on a candlelit farewell dinner while the kids are entertained with a pizza party at the Poolside Grill. Traverse the property at the 320 Guest Ranch in search of a cleanly imprinted grizzly track in the dried mud. Learn the difference between Yellowstone’s four geothermal features: geysers, hot springs, mud pots, and fumaroles. Take a guess at why Yellowstone’s bubbling hot springs come in a wide array of bright colors. Taste your way through an assortment of wild game options, perhaps the elk tenderloin, antelope sausage, or duck breast will be to your liking! Spot all kinds of wildlife ranging from the cute, furry Uinta Ground Squirrel to the massive, shaggy American Bison. Observe the effects of wildfire in a lodgepole pine ecosystem, past and present. Listen to a rancher’s side of the story as you hear Martin or Jack Davis, fourth generation cowboys, explain how Yellowstone’s reintroduced wolves have affected their cattle population. Find out why Chico Hot Springs Resort is a favorite celebrity haunt. Discover for yourself this place they call Big Sky Country. Any other necessary equipment – all safe and well maintained.